This summer, there will be more than just the resident barn swallows dive bombing at the Winslow Farm. 4th Line Theatre presents the world debut of David S. Craig’s play Bombers: Reaping the Whirlwind, directed by David Ferry and running until July 29th. 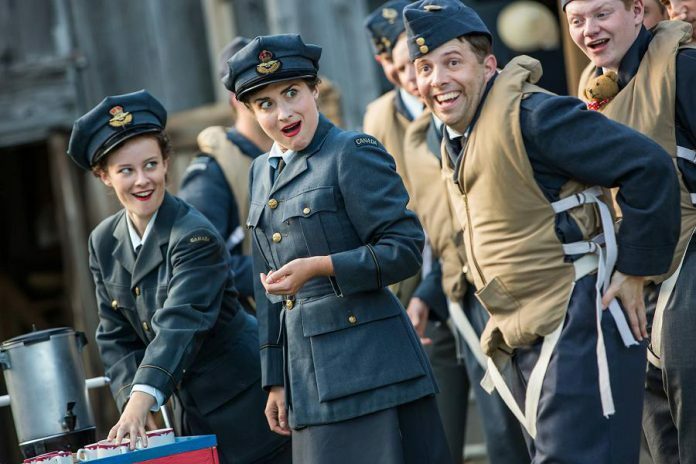 The latest in 4th Line Theatre’s tradition of presenting historical dramas celebrating seldom-told stories, Bombers is a well-crafted drama centered about the Royal Canadian Air Force’s Bomber Command and the men and women of No. 6 Bomber Group. Once again, 4th Line has created an elaborate and meaningful piece of summer theatre that is going to become another audience favourite. Based on 30 years of research and interviews conducted by David S. Craig, Bombers is the story of Sgt. Peter Benton, who is performed by two different actors — 4th Line Theatre’s creative director Rob Winslow in the present day and actor Michael Cox during the Second World War. 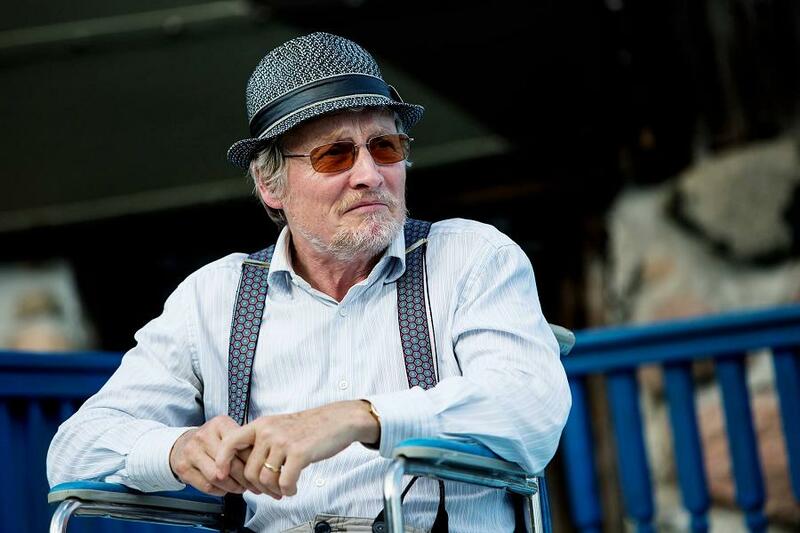 The multi-layered show is bookended by scenes taking place in the present, with the majority of the story presented in flashbacks as Peter’s story unfolds. When: Performances at 6 p.m. Tuesdays to Saturdays (July 4 & 5, July 6 – 8, July 13 – 15, July 20 – 22, July 27 – 29, 2017) with additional performance at 6 p.m. on July 24, 2017. Written by David S. Craig and directed by David Ferry. Starring Michael Cox, Robert Winslow, Erin Humphry, Shaina Silver-Baird, Deb William and an ensemble cast of 30 actors portraying 60 characters. Lyrics and original composition by David S. Craig. Musical direction, original composition and arrangements by Justin Hiscox. Costume design by Karyn McCallum. Set design by Glenn Davidson. Choreography by Monica Dottor. Note: features strong language and some mild sexual content; not recommended for children under 10. Tickets available by calling 1-800-814-0055 or 705-932-4445, visiting 4thlinetheatre.on.ca, emailing boxoffice@4thlinetheatre.on.ca, or at Peterborough Museum and Archives (300 Hunter St. E., 705-743-5180). When a young PHD student from Oxford University (Erin Humphrey) comes to Canada seeking out former bomber pilots from World War II, she tracks down the now elderly Peter Benton (Rob Winslow), who lives a quiet life under the care of his daughter Margaret (Deb Williams). Having packed away his memories of WWII long ago, Peter is unwilling at first to talk to the student — until she presents him with an old photo of a lost love from his time in England. With the photo as the trigger point, Peter begins to open up for the first time about his time as a bomber pilot, revealing a story filled with good times, bad times, danger, romance, and loss. 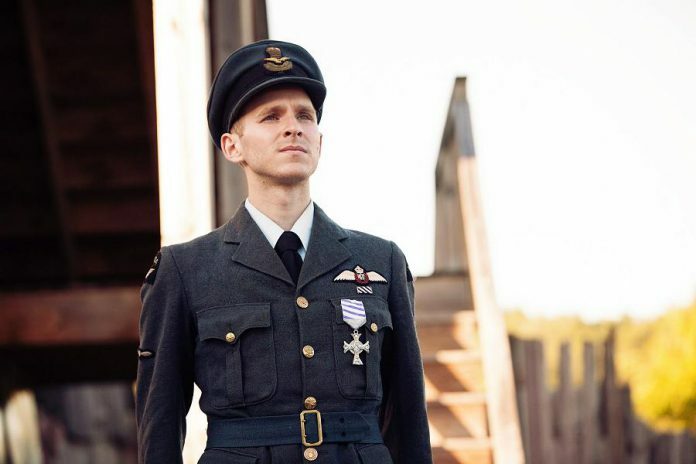 As Peter begins to remember, the stage comes to life with the people and places of his past, when the 20-year-old Peter (Michael Cox) joins the RCAF to fight in Europe during WWII. While on a ship from Halifax to London, Peter meets a young nurse named Emma Ross (Shaina Silver-Baird) who is on her way to London to serve as a nurse. Despite an immediate attraction the two don’t meet again until six months later, when tragedy has already struck Emma, making her a woman who is afraid to love. While Peter divides his time between flying dangerous missions over Berlin and working up the ranks in Bomber Command, he falls madly in love with Emma. As the winds of war tear the world to pieces, they also threaten to tear Peter and Emma apart as well. Bombers is not only a war story — it is also very much a love story dipped in tragedy, serving as an anchor to hold together the colourful and fascinating history of the RCAF. This is not the first time 4th Line Theatre has tackled the subject of Canada during times of war, having staged Wounded Soldiers last year. However, what is refreshing about Bombers is that playwright David S. Craig and director David Ferry have managed to create a period piece filled with nostalgia and romanticism while still taking a realistic and blunt look at the politics, madness, and death that follows war. The show’s tagline “reaping the whirlwind” comes from the proverbial phrase “They that sow the wind, shall reap the whirlwind”, which in turn comes from the Book of Hosea in the Hebrew Bible (Hosea 8-7). Although the show is filled with tragedy, it never gets bleak and, while the lows are filled with pathos, the highs (and there are many of them) are full of love, laughs, and endearing characters. 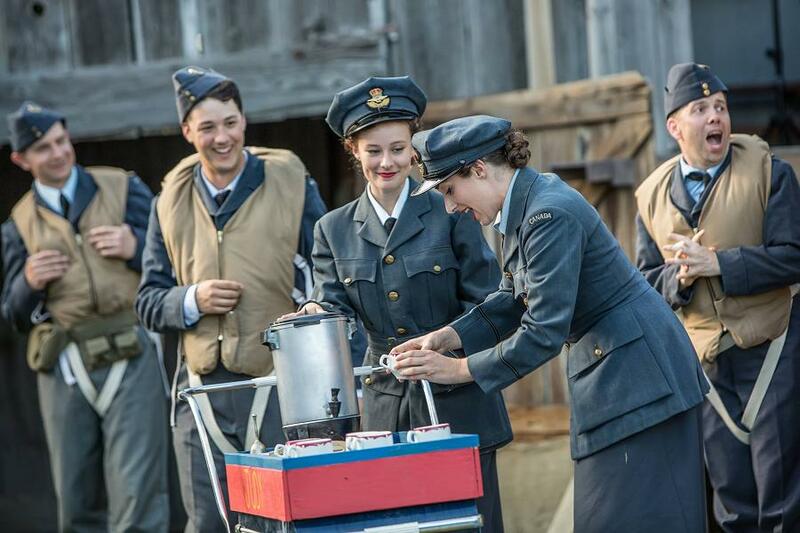 The youthful energy of the cast playing the men and women of the RCAF lifts the show up again and again. While most obviously a war story and a love story, Bombers is also a coming-of-age story. Peter is only 20 years old when he enters the RCAF, and many of his comrades are even younger than he is. Although the pilots are there to fight the Germans, they are still boys who are interested in women, dances, liquor, and having a good time. While the world burns down around them, the pilots are going to have a good time. War is a hell of a way for a young man to learn the harsh realities of the world, and Craig’s script brings on the hell of war. Bombers features a strange juxtaposition of joy and sadness, but hits the heart in all the right tender spots. As the young Sgt. Peter Benton, Michael Cox takes Bombers on his shoulders. Instantly likeable, Michael is able to hook the audience from the moment that he walks on stage, making you immediately care about this character and want to take this journey with him. Proud, brave, kind, and good natured, Michael becomes the constant focus of every scene within the show, seemingly to almost never leave the stage. 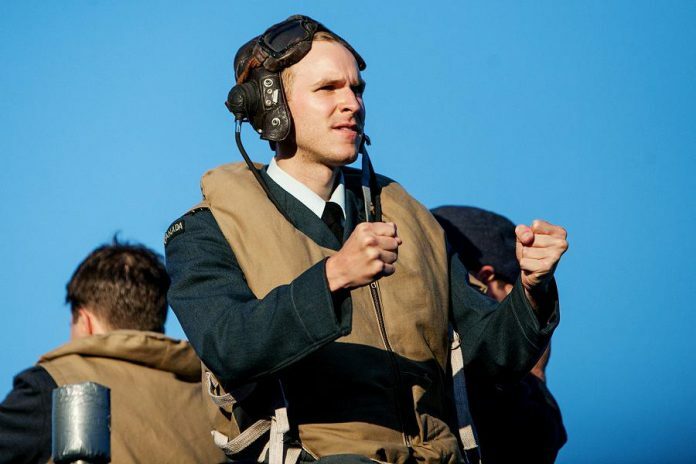 Most of the most joyful scenes feature Michael with the other members of the RCAF, including Andrew Pedersen, Ken Houston, Kelsey Powell, Lucas DeLuca, Andrei Preda, Justin Laurie, Ethan King, Liam Davidson and — most notably — Colin Doyle as Peter’s best pal Sgt. Danny O’Neill. When they are not fighting and dying, they are drinking and dancing and looking for girls. Once again, they are still just boys fighting in a war. But the performers create a very genuine sense of camaraderie, giving the scenes between the male cast members a truly authentic feel. Meanwhile, Michael and Shaina Silver-Baird, in the role of his romantic counterpart Emma, have a lovely chemistry with one another. Although anyone with a heart would want their love affair to work out in a happy ending, in the first few moments of the show you know that these two are not destined to be with one another. This adds intrigue to the show, as the story unfolds to reveal all the reasons why their love affair was not to last. Rob Winslow, Erin Humphery, and Deb Williams become interesting elements to the show. Rob and Erin never leave the stage, while Deb weaves in and out, as the show’s drama unfolds around them with the narration of Peter’s story in the past. Despite their constant presence on the stage, they somehow manage to fade within the background, and eventually become almost invisible despite being in plain sight. Sometimes you’ll notice Erin or Deb from the corner of your eye, or Rob will be dragged into a scene when the people from his memories speak to him. But mainly they fade in and out of the story without actually fading from view. It’s a subtle illusion that works quite well. Bombers also has a few nice character bits, including a rousing performance by Matt Gilbert (as legendary WWI Canadian war hero Billy Bishop) and charming over-the-top comic relief by Kait Dueck and Frances Loiselle (as Trudy and Judy, the tea girls). 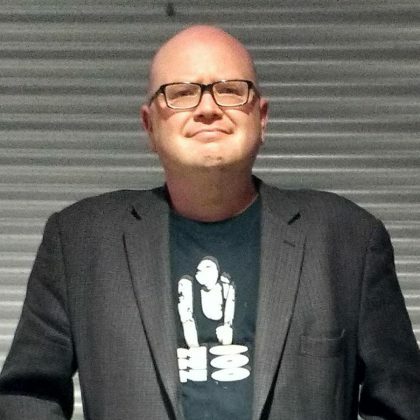 One of the most compelling side stories is the story of Gordon Best, the namesake of the theatre located above The Only Café in downtown Peterborough. I must admit I didn’t know anything about the man, portrayed in the play by Liam Davidson, despite spending many evenings in this local performance space. Bombers gave me a history lesson I will surely remember every time I climb the famous staircase at the Gordon Best. 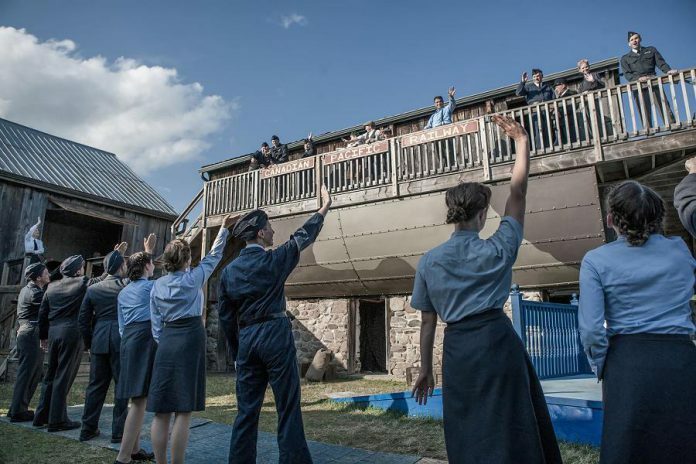 Although 4th Line Theatre has always managed to be inventive with its outdoor stage space, this year they’ve outdone themselves in staging the two elaborate air battle sequences. Without giving any plot away, two major sequences take place as Peter and his men fly raids over Germany. In these highly dramatic and important scenes, David Ferry and his company manage to find two different and unique ways to depict these sequences that I found fascinating to watch. I was surprised when they didn’t use the first brilliant flight illusion a second time, but instead used an equally creative flight sequence resulting in powerful impact. The flight sequences are brilliant, and allow the men to fly into battle without actually taking flight. It is something you need to see to understand, but I applaud the company in the creation and performance of these key scenes. Equally fantastic are the two elaborate dance sequences in the show choreographed by Monica Dottor. Accompanied by musical direction by Justin Hiscox, these numbers capture the swing era in full force and become another element creating the constant sense of joy and energy that runs through the show. Finally, I would like to make note of the way Bombers portrays the Germans. Although I can’t go into details without spoiling the show’s conclusion, in some key scenes in the second act the play brings in members of the Nazi party as well as everyday German citizens. 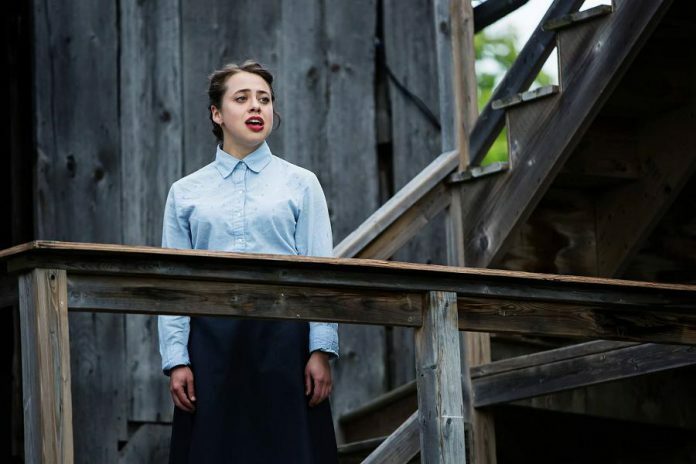 Although it’d be natural to treat them as villains, the play humanizes the Germans by revealing that war destroys lives on both sides of a conflict, and that the pain and loss suffered by the Canadians were just as painful for the Germans. This is a portrayal of the “enemy” that could have gone very wrong if not treated in a sensitive and respectful manner, but Bombers does this with tact and great insight, giving these scenes a bold twist. 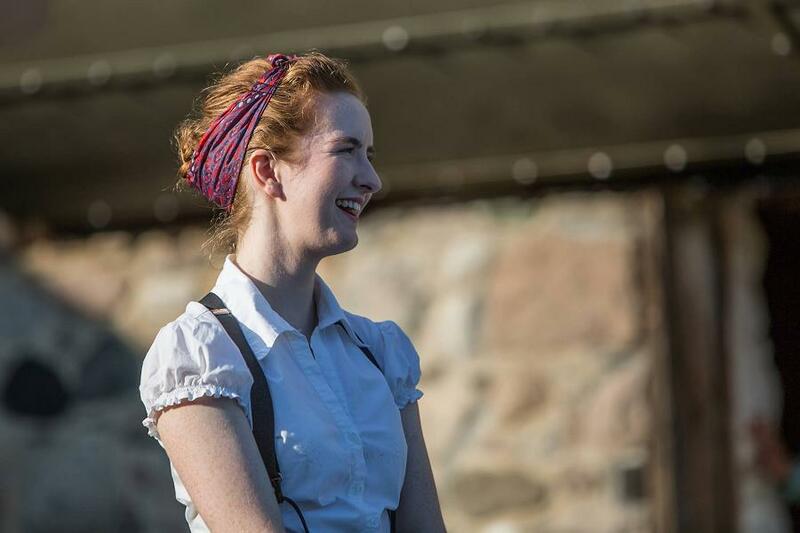 There is so much more I could say about Bombers, but the bottom line is 4th Line Theatre has put together a wonderful show that really has something for everyone. It has history, action, comedy, romance, tragedy, and joy. It has music and dancing, a sensational cast, great costumes, clever direction, and great use of a unique performance space. But most of all, it has a strong story that is cinematic in scope with a lot of heart. Needless to say, 4th Line Theatre has another hit on its hands. Bombers is the kind of show that makes Winslow Farm one of my favourite summertime destinations. 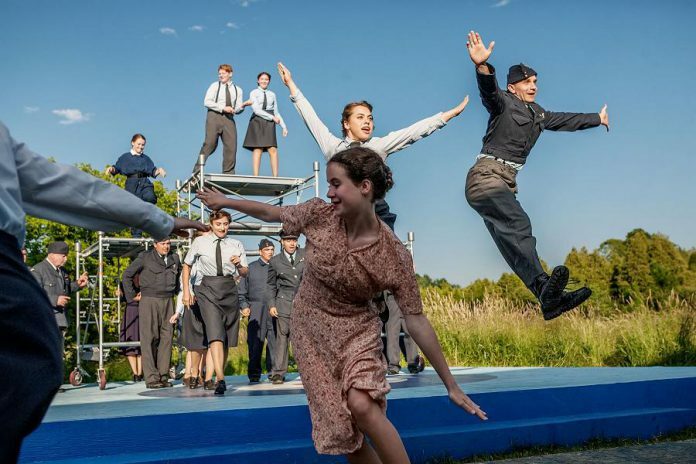 Bombers runs from Tuesdays to Saturdays until July 29th at the Winslow Farm (779 Zion Line, Millbrook), with an additional performance on Monday, July 24th. Single tickets are $38 for adults and $32 for youth. Subscription tickets (which include one ticket to Bombers and one ticket to The History of Drinking in Cavan in August) are $66 for adults and $56 for youth. Tickets can be purchased by phone at 1-800-814-0055 or 705-932-4445, online at 4thlinetheatre.on.ca, or at 4th Line Theatre’s Box Office at 4 Tupper Street in Millbrook or at the Peterborough Museum and Archives at 300 Hunter Street E. (Museum Drive) in Peterborough.